Feb. 2, 2019 - The Citizens Bond Oversight Committee met last night at Boles Junior High for its quarterly review of the status and progress of the 2014 Bond program. AISD Chief Financial Officer Cindy Powell gave updates on the various areas of the bond: fine arts; safety, security and technology; transportation; and facilities. Director of Fine Arts Dr. Christopher Anderson also spoke on the state of fine arts in the district. Anderson highlighted the growing student participation in fine arts, the impact of the Bond 2014 program on fine arts, and the exciting opportunities the future Fine Arts Center will provide. 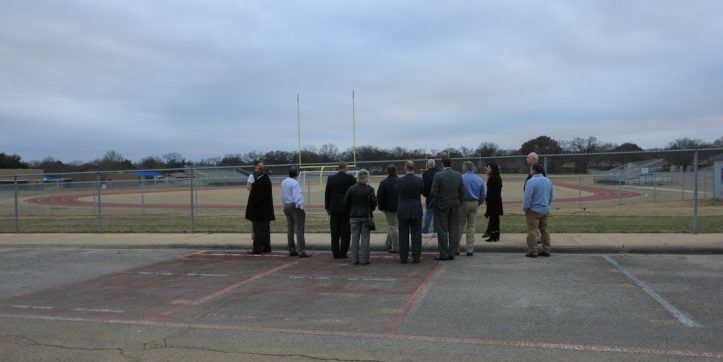 With the meeting held at Boles Junior High, the committee received a tour of the bond-funded projects at that campus, including the new classroom addition, renovated classrooms for the alternative curriculum program and the new track and field.